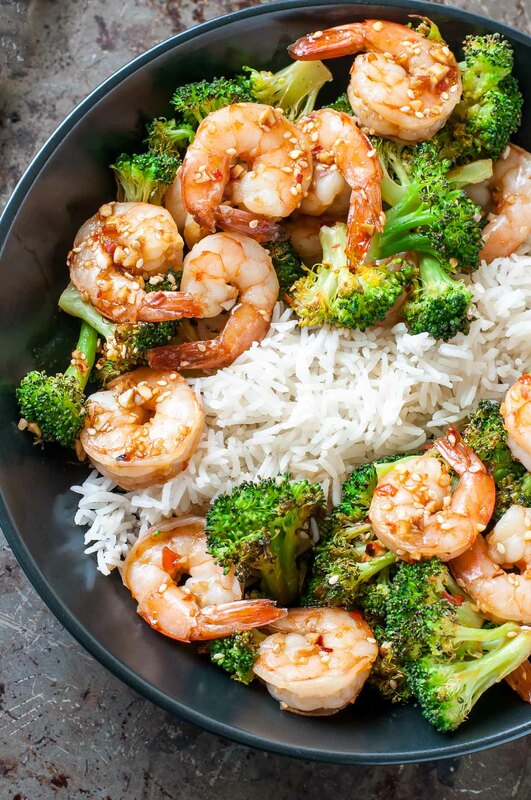 Flavorful roasted broccoli and tender, juicy shrimp join forces in this super easy Sheet Pan Honey Garlic Shrimp and Broccoli. This one pan wonder makes a great fuss-free weeknight dinner! I always seem to break out the sheet pan suppers when I don’t feel like grocery shopping. A quick dive in the freezer and into the crisper drawer and this tired momma lives to procrastinate another day. Desperate times call for desperate measures, yo! Or should I say desperate times call for DELICIOUS measures? Yup! Let’s go with that. I almost always have something crunchy and green that’s on it’s last leg and raw shrimp reside in our freezer at all times. 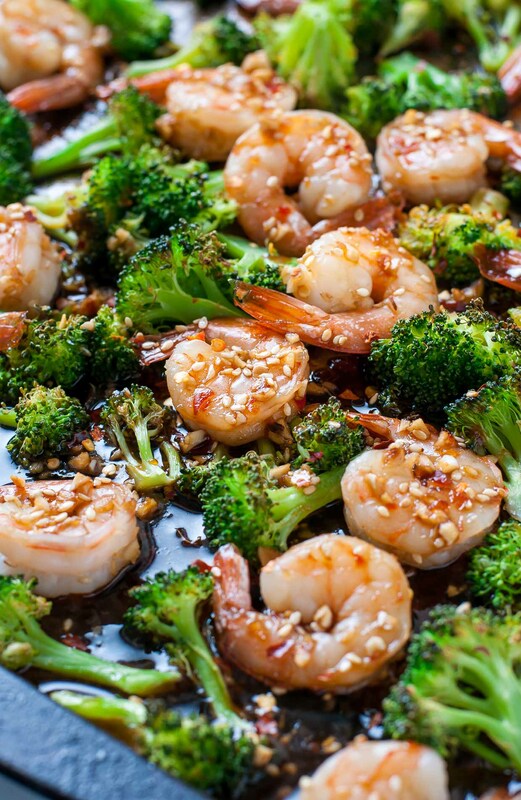 We’ve been leaning super heavy on my Szechuan Shrimp and Broccoli recipe but wanted to jazz things up a little. The simple act of roasting the broccoli added so much glorious flavor to the mix! And the honey garlic sauce? Love it so! Sheet pan honey garlic shrimp and broccoli to the rescue!!! You guys are going to flip over how quick and easy this one is. Have I mentioned it’s crazy flavorful too? And with minimal clean-up to boot! You can keep the sauce thin like we did or go all out and thicken it on the stove in a saucepan. Simply bring the sauce to a low boil and add a few teaspoons of corn starch (diluted in a little water) to the mixture and stir well until thickened. You can also increase the honey to soy sauce ratio as desired. Equal parts honey and low sodium soy sauce was perfect for us, as we don’t usually make super sweet sauces. Want it super sticky? Reduce the soy sauce to 2 TBSP and add extra honey to taste. You can always adjust as needed along the way. Easy peasy sweet and savory! Whisk together your sauce ingredients and set aside. Roughly chop broccoli into florets, leaving a bit of a stem on each. Place broccoli on a baking sheet, drizzle with olive or avocado oil, and massage oil into florets. Add salt and pepper to taste. Roast at 400 F for 15 minutes. Prep shrimp as needed; tail can be left on or off based on preference. In a bowl, combine 1/2 of your sauce with the shrimp and toss to coat. Allow to marinate until 15 minute mark has passed for the broccoli, then move the broccoli to one side of the sheet pan and add your shrimp to the other side. NOTE: In the photo I have them all mixed together, which took way more time. 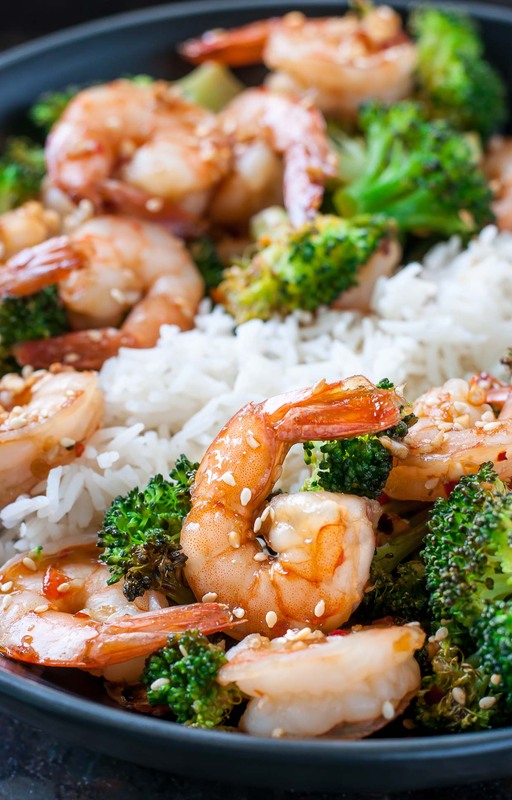 Shrimp on one side and broccoli on the other side is the way to go! Return sheet pan to oven and bake an additional 8-10 minutes until shrimp turn pinkish, opaque, and curled. The remaining sauce may be heated in a saucepan until simmering and reduced into a thick sauce (2-3 tsp of corn starch diluted in water can help thicken it even further if desired or you can add extra honey) or drizzled over your shrimp as is. Plate and enjoy immediately while hot. Hankering for a kiss of heat? Break out the Sriracha and/or crushed red pepper flakes and get spicy with it! 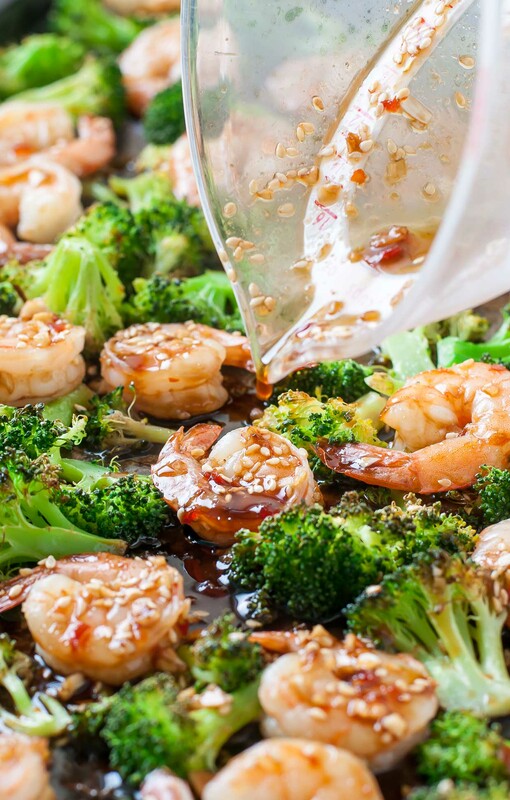 If you get a chance to try this Sheet Pan Honey Garlic Shrimp and Broccoli, let me know! You can leave me a comment here (LOVE checking those daily!) or tag @PEASandCRAYONS on Instagram so I can happy dance over your creations. I can’t wait to see what you whip up! I cooked up a cup of basmati rice in my Instant Pot using a 1 cup rice :: 1 cup water ratio. Simply hit the rice button (12 min) and walk away! If you haven’t noticed by now, I basically want to marry my pressure cooker… and so does my husband! If you make this wicked easy Sheet Pan Roasted Honey Garlic Shrimp and Broccoli let me know! I can’t wait to hear all about it! I just made this tonight and it was great! I did make a mistake and dumped the shrimp into ALL of the marinade/sauce, but it worked out just fine. I poured the shrimp on the pan and used the remaining marinade to put on top of the veggies so they got some of the sauciness too. I also only had a little bit of broccoli so I cut up a couple carrots as well. Really delicious and so easy!! This was a hit and very easy. Clean up very quick. Love the easy marinade/sauce and will use it on other foods as well. SO glad you enjoyed it Cathy; thank you! Just made this tonight! Added red and orange peppers. I would suggest an equivalent amount of veggies to shrimp because I used XL shrimp and it seemed like there wasn’t enough veggies but my husband loved it and the sauce was amazing! Can’t wait to use the suace in other recipes. This was an easy weeknight dinner. Only change was that I added a small amount of cornstarch to the remaining sauce to thicken it a bit. It was amazing! The whole family loved it. It wasn’t too sweet and has just the right amount of sauce. I did use a little more broccoli than the recipe called for as we like our veggies. Will definitely put this in the dinner rotation! Loved it! I did 1/2 broccoli and 1/2 cauliflower. Also topped it with a few diced cashews for crunch. Can’t wait to eat the leftovers tomorrow! Sounds AMAZING! Thank you Courtney! I made this for my boyfriend and I this evening. He and I both enjoy spice so I tweaked your recipe a bit by adding sliced Serano peppers to the roasted veggies and I incorporated crushed red pepper into the marinade. What an easy and delicious dinner!! Totally trying it with some spicy peppers next time – YUM!!! I am LOVING these sheet pan meals. A revelation in my kitchen! Thank you for sharing ? My kids loved this, as did my husband and I. It tasted better than a Chinese restaurant version I’ve had! Will definitely keep this one! So super stoked! 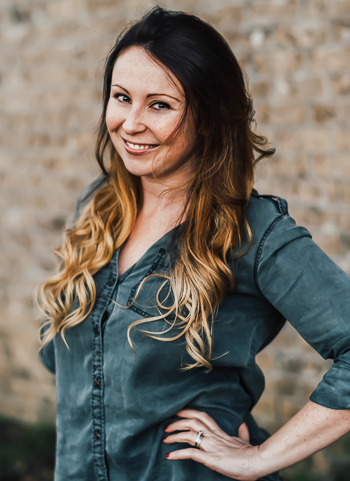 Thank you Laura – I’m glad it was a hit! How many calories per serving? Unless I’m an idiot and can’t read where is says that…. Hey Alexandra! I’m still working on uploading about 300 more recipe cards with nutrition info. I’ll try to do this one next! This is a great recipe for those busy evenings or lazy week-ends, and I love shrimp. Thanks for sharing. Honey and garlic are such a great flavor combo! Usually, we make chicken, but this shrimp recipe was delish! The shrimp’s speediness keeps me coming back for more! So glad you’re loving it Rebecca! 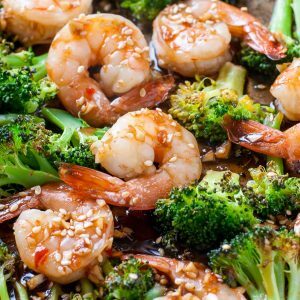 I just LOVE sheet pan meals, and this shrimp and broccoli looks amazing! Meeeee too! Sheet pan meals are just SO stikin’ easy! I need more in my life stat! Sounds wonderful, thank you Ricci! I just now made this simply with what i had in the kitchen. I’m not good at cooking AT ALL, and this dish was quickand easy. Plus it saved the day for needing a quick, healthy meal. Thanks!! So so glad you enjoyed it Justin! Thank you! This dish was nice and easy. i doubled the sauce and reduced on stove while brocoli and shrimp cooked. The whole family liked this great dish. Lots of compliments. I accidentally purchased cooked cocktail shrimp. Can I still cook everything the same way? Hey Ashley! You wont want to cook the shrimp a second time or it’ll be rubbery and not tender. For this recipe you’re for sure going to want to use raw. I’d use the cocktail shrimp for a fresh shrimp salad. I have a Shrimp Panzanella Salad and a Cilantro Lime Shrimp Salad you could use the pre-cooked shrimp in (just skip the instructions within the post for cooking the shrimp) — you could also whip up some shrimp cocktail too – it’s great this time of year! Made this tonight and it was a hit! I had frozen broccoli on hand so I thawed some and used that. I think 1 pound of broccoli to 1 pound of shrimp was the perfect ratio when served with Basamati rice. I’ll definitly be making this again! This meal is so delicious! I have made it half a dozen times and frequently use it on my weekly meal list. 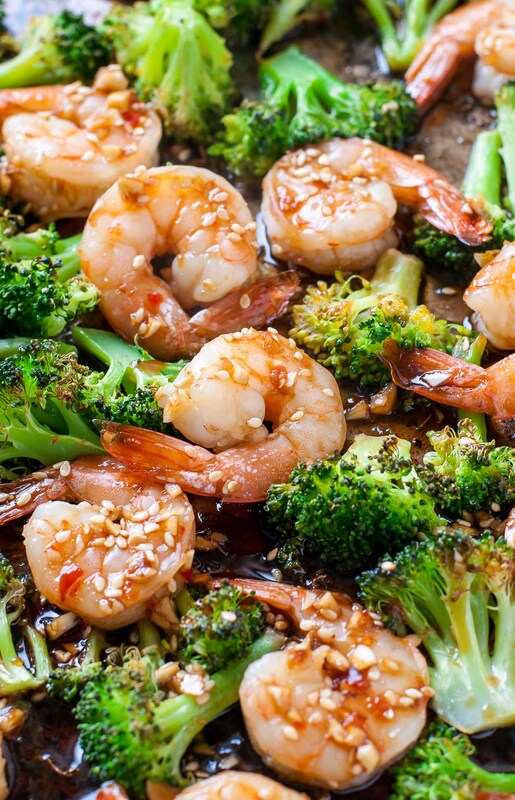 I double the broccoli and use two sheet pans – 1 for shrimp and one for broccoli. I also only marinate the shrimp in half the sauce and reserve the other half. Once the shrimp is cooked, I use the cooked shrimp juice by adding it to a small pot and the remaining reserved honey garlic sauce and thicken it up to a glaze by just adding some corn starch. I then toss it all together with the broccoli and shrimp and I put it on top of Jasmine rice. Its SO good! Thank you! So so glad you’re loving the recipe Selina, thank you!! Not to nit-pick, but shouldn’t this be filed under “pescatarian” and not “vegetarian”? Very good point Kyle, and you’re right! I spent 6 years as a pescatarian and often just said vegetarian because so many people were like… “pesca-what? !” I’ve clearly gotten in a weird habit with that.